Braintree checked Cheltenham's National League title charge courtesy of Michael Cheek's second-half header. Cheltenham stay top of the table by a point ahead of Forest Green, but never got into their stride at Cressing Road. The Robins survived a goalmouth scramble and a half-volley from Cheek before the break. Chez Isaac crossed for Cheek to head home the winner after the interval and Braintree held on for a deserved win as Asa Hall struck the home side's post. Cheltenham Town manager Gary Johnson told BBC Radio Gloucestershire: "It's always disappointing when you lose a game - we knew what to expect from them but we couldn't handle it. "They've done very well and we weren't good enough to break them down and when we were, it was given offside. "Some of the boys didn't perform today, they showed energy and work rate but maybe their mindset has gone a bit and they're not believing that they're top of the league." Match ends, Braintree Town 1, Cheltenham Town 0. Second Half ends, Braintree Town 1, Cheltenham Town 0. Offside, Braintree Town. Anthony Edgar tries a through ball, but Anthony Edgar is caught offside. Attempt saved. Dan Holman (Cheltenham Town) left footed shot from the centre of the box is saved. Attempt blocked. Mitch Brundle (Braintree Town) right footed shot from outside the box is blocked. Assisted by Anthony Edgar. Substitution, Braintree Town. Anthony Edgar replaces Sean Marks because of an injury. Foul by Cameron Burgess (Cheltenham Town). Attempt missed. Daniel Wright (Cheltenham Town) header from the right side of the six yard box misses to the left. Assisted by Kyle Storer with a cross. Offside, Braintree Town. Alex Woodyard tries a through ball, but Alex Woodyard is caught offside. Attempt missed. Dan Holman (Cheltenham Town) left footed shot from the centre of the box is too high. Assisted by Jonathan Flatt. Attempt saved. Simeon Akinola (Braintree Town) header from the centre of the box is saved. Assisted by Chez Isaac with a cross. Cameron Burgess (Cheltenham Town) is shown the yellow card for a bad foul. Substitution, Braintree Town. Sean Marks replaces Michael Cheek because of an injury. Goal! 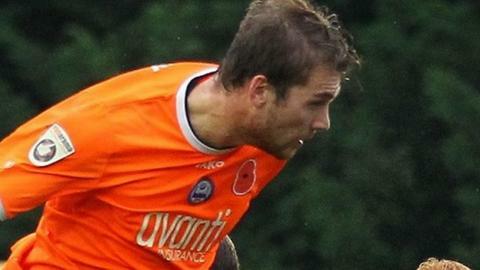 Braintree Town 1, Cheltenham Town 0. Michael Cheek (Braintree Town) header from the centre of the box to the top right corner. Assisted by Chez Isaac with a cross. Attempt missed. Daniel Wright (Cheltenham Town) header from the centre of the box. Assisted by Kyle Storer. Attempt missed. Harry Pell (Cheltenham Town) right footed shot from outside the box.